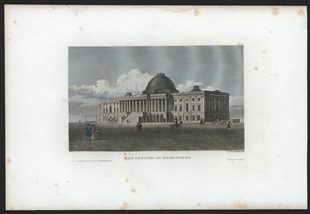 This print from a German publication shows a view of Pennsylvania Avenue looking toward the Capitol. The viewer’s perspective is positioned behind the back of a sailor, implying an approach to the scene as a visitor. 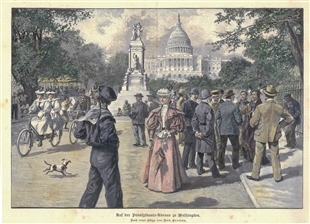 The elements included in the scene combine to create an impression of Washington as a diverse and modern place—Native Americans, Asians, and African Americans mingle amidst new inventions like tandem bicycles and streetcars.